The cliffs of Loughshinny are formed by layers (beds) of limestone and shale, which have been folded into angular layers. The fossils in the rocks - corals, brachiopods and goniatiles, a species characteristic of the Carboniferous period are approximately 325 million years old. At the time the area that is now Loughshinny was probably the floor of a tropical sea. The sea floor was continuously subsiding so that the rocks now seen in the cliffs were buried by many hundreds of younger rocks. About approximately 290 million years ago subsidence stopped and the rock pile was subjected to horizontal compression. The layered rocks buckled to form the folds we can now see. 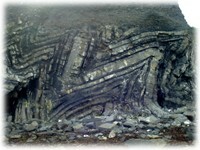 Subsequent uplift has brought the folded limestone and shale to the surface. The upper few metres of cliff are made up of boulder clay from the ice age. The cliffs can be seen clearly at low tide when it is possible to walk to Ballustree strand.